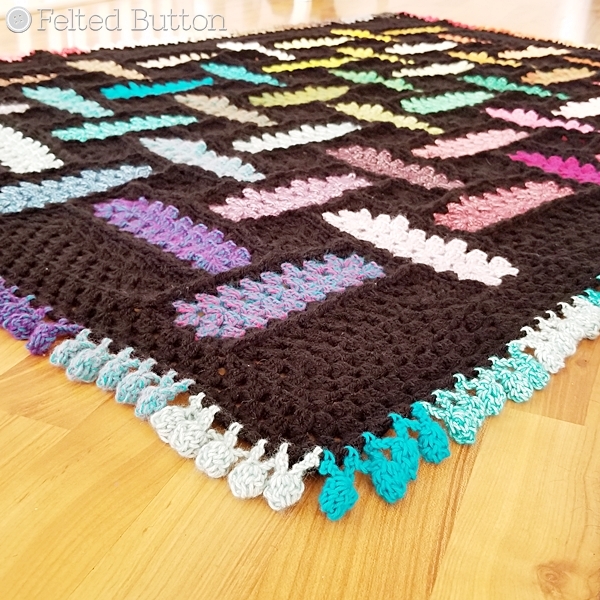 Last week I shared my newest free crochet pattern, my Warp and Weft Blanket. 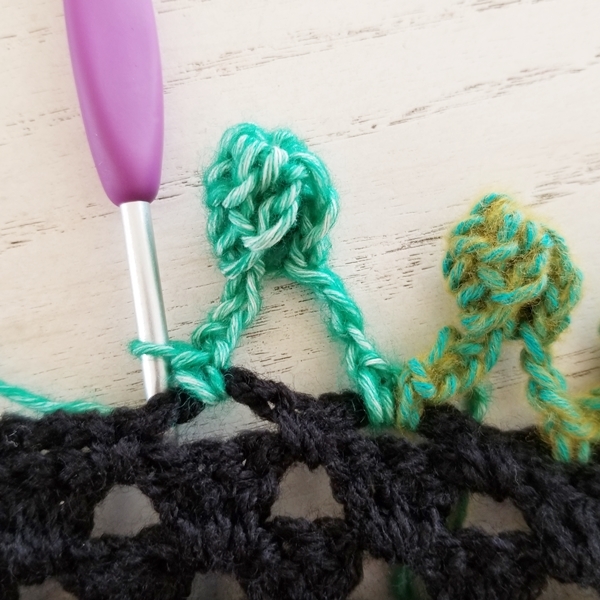 AS the finishing touch, I added this really whimsical pom pom edging around the border and am really happy with how it turned out. 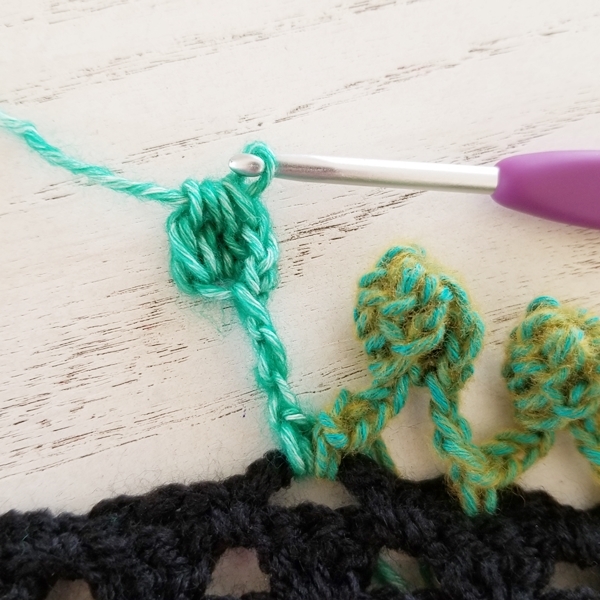 Today I wanted to share a tutorial on how to work the little bobbles of fun! 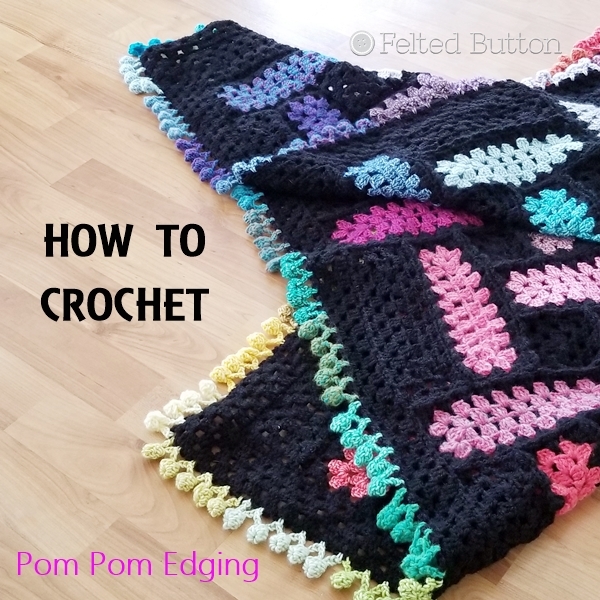 By the way, the written instructions for the pom pom edging can be found in the blanket pattern post here. 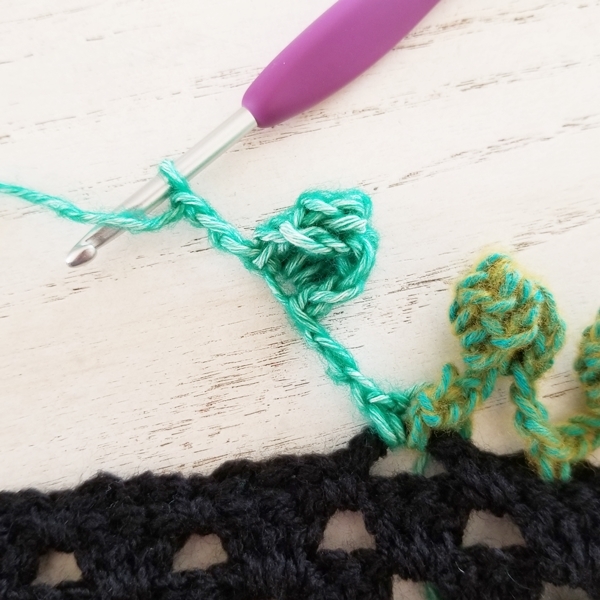 You can also snag a printable copy of the blanket pattern with this tutorial included on Ravelry here, Etsy here, Craftsy here or LoveCrochet here for $2. 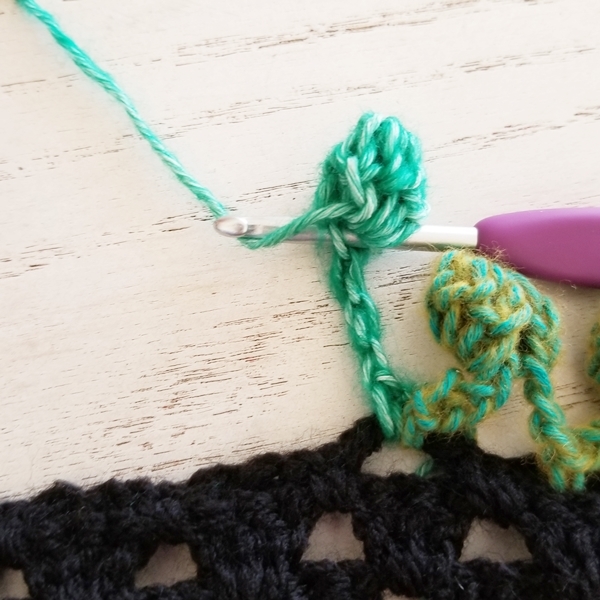 This pom edging was Rnd 6 of the Warp and Weft blanket, but you could add it to almost any border--or as a stand-alone border. I can picture it used along the edge of a kitchen towel, curtain or even used for wrapping packages by attaching them to a chain or length of sc. In typical Felted Button fashion I used multiple colors in my border for this one, but you can work it in a single color if you wish. 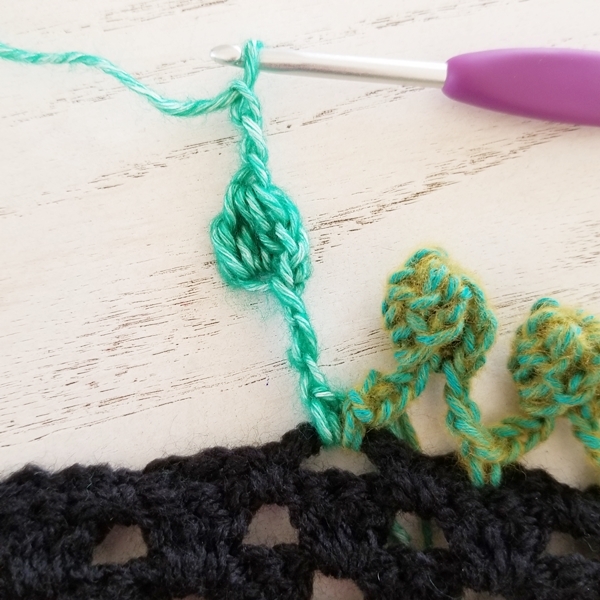 Since I was working with only 10g of each cutie pie ball from the Scheepjes Stonewashed/Riverwashed Colour Pack*, I only had little bit of each color left, so it works out perfectly to change the color every few bobbles. 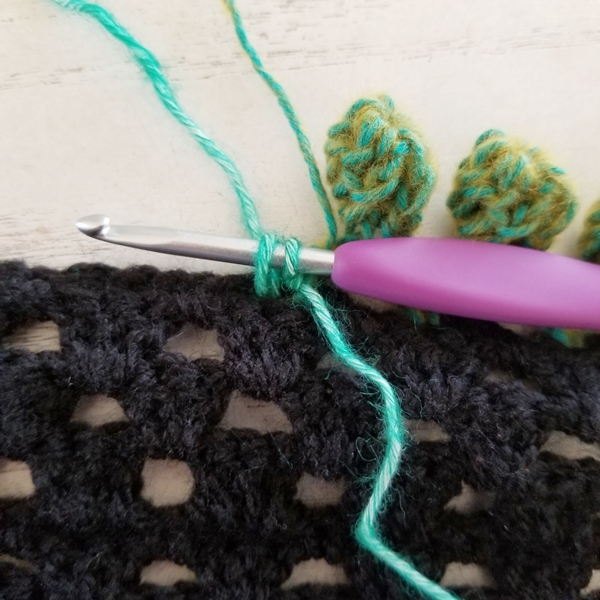 For this blanket, I was working into the ch-3 loops of Rnd 5. 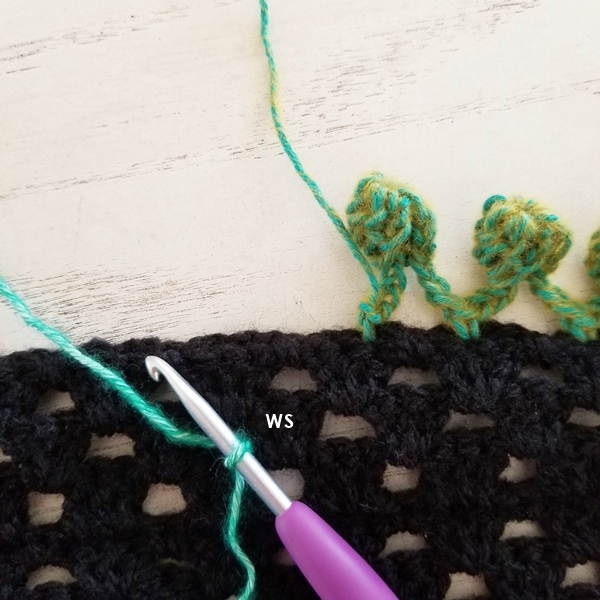 Since I think the bobbles look a bit better from the wrong side, or opposite the side facing you when worked, I turned my blanket to the wrong side (WS) before adding the poms. You might want to consider this when attaching them to your project. 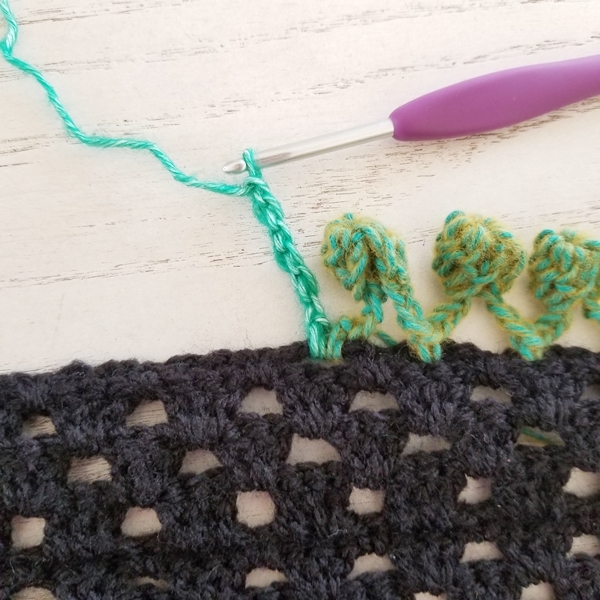 Also, this tutorial is written in US terms and those are defined in the blanket pattern here. Start with a slip knot on your hook as shown above. Then join with a sc. 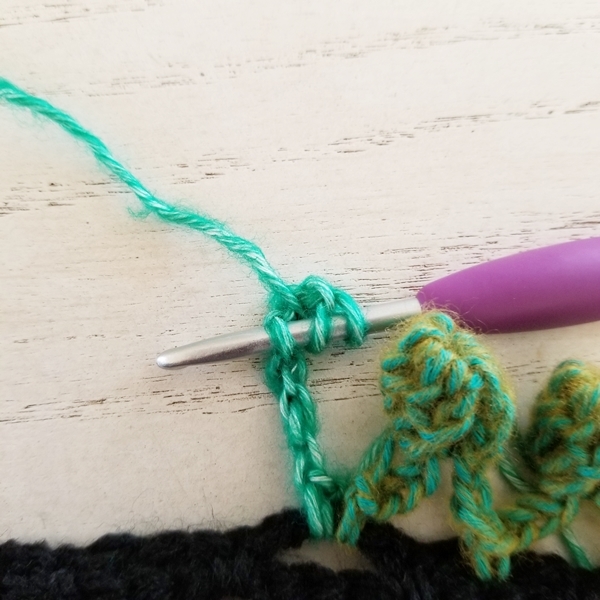 Insert your hook through the edge of the work, yarn over and draw through (two loops on hook), yarn over and draw through both loops on your hook. You've completed a sc join. Notice that for the Warp and Weft Blanket you've joined your sc in the same stitch where the last color ended. Now ch 6. ...yarn over and draw through two loops. This is your first half-completed dc of the 3 total dc that will make up the puff. This first half-completed dc is shown by the white X below. Now yarn over, insert your hook in the same sp, yarn over and draw through, yarn over and draw through two loops on your hook (two half-completed dc). Repeat this a third time. See the three white Xs? Those are the 3 half-completed dc. 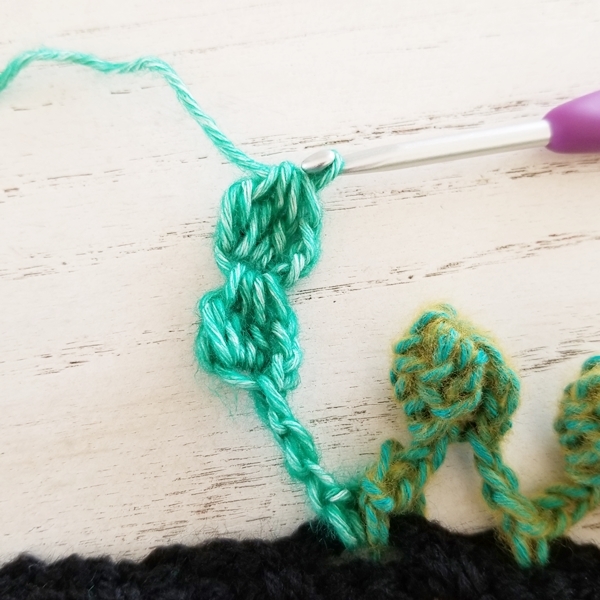 Now yarn over and draw through all 4 loops on your hook to complete the puff. Looking good so far. Now ch 3. 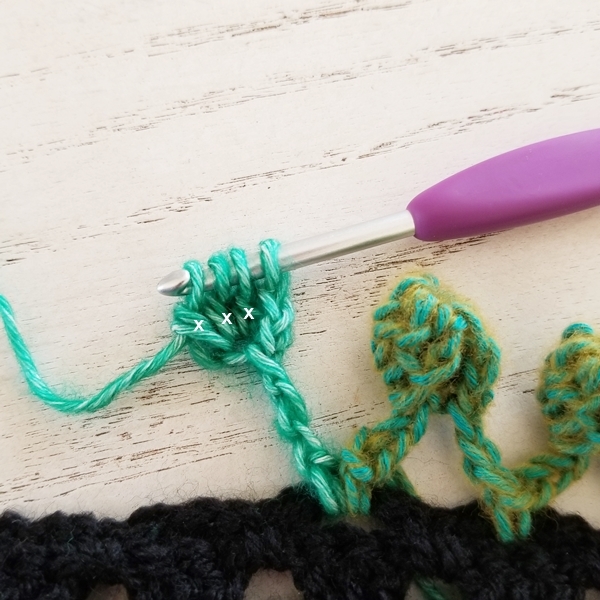 Make another puff, just like above, in the third ch from your hook. 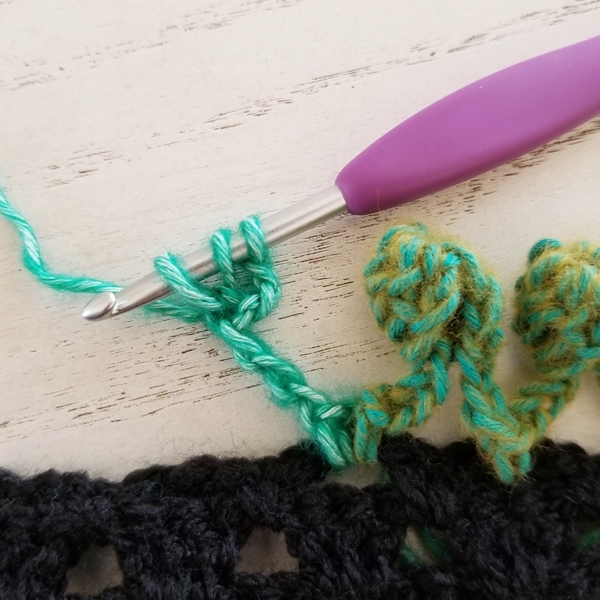 With two puffs sitting on top of each other, you can now "fold them" together by slip stitching in the bottom of the first puff to make a pom. ...and sc in the next chain space. 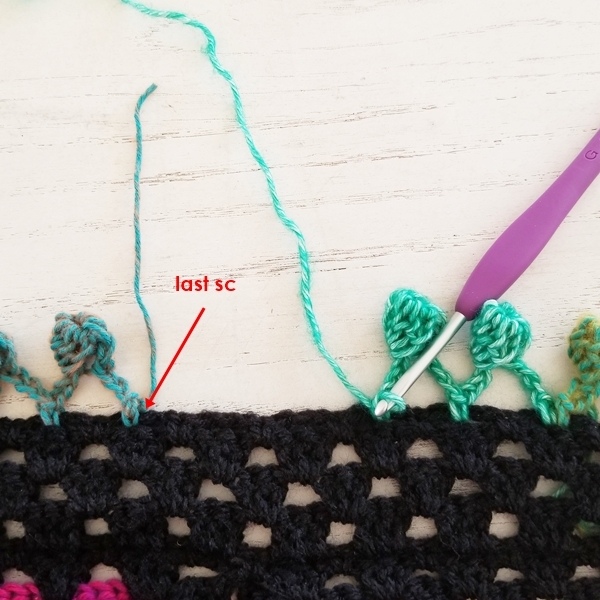 If I had been working this edging in a single color, I might have placed a (sc, ch 3, pom, ch 3, sc) all in the corner chain space, but you can play with what works for you. Once you get the hang of this, I think you'll find that it has a lot of possibilities! I hope this is helpful to you. I really like the whimsical and somewhat retro style of this edging. It's a nice finishing touch--especially on a modern take of the traditional granny! I've got a HUGE blanket that is nearly finished. I teased a bit with the early motif here. It's taken me ages because I've been so distracted with a bazillion fun projects (squirrel...!! ), but I'll share soon on my Facebook page here and Instagram (@FeltedButton). And when the pattern is ready for release, I'll let you know! 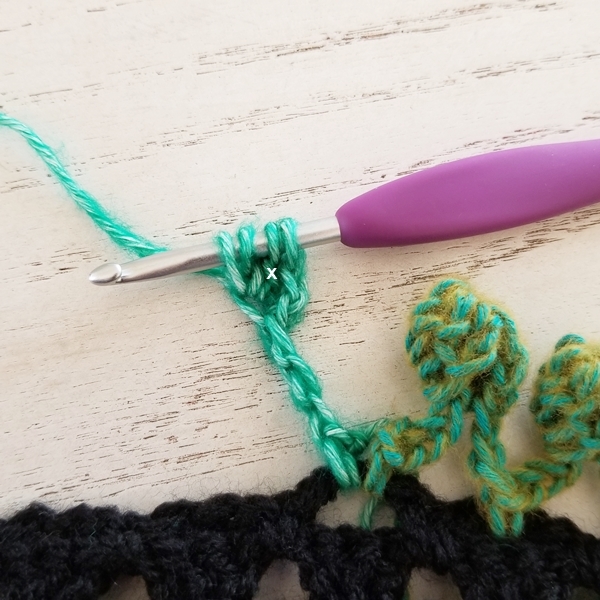 *This post contains an affiliate link, if which used by you costs you no more but provides me a small commission which allows me to continue providing free crochet patterns and tutorials.